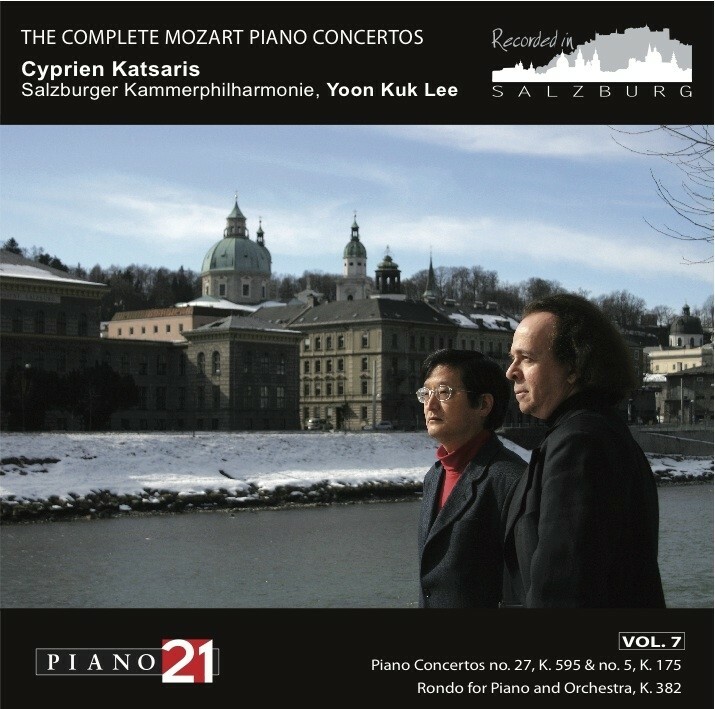 Volume 1 recorded live in the Grosser Saal of the Mozarteum in Salzburg by Cyprien Katsaris under the charismatic conductor Yoon K. Lee and his remarkable Salzburger Kammerphilharmonie is part of the complete Mozart piano concertos performed in Salzburg and Vienna. It contains Concertos no. 13, K. 415 and no. 22, K. 482 in a very bold and personal interpretation. Concerto no. 22 was Cypriens first encounter with Mozarts concertos  at the age of eleven  and he still believes it to be one of the most difficult. A distinguishing mark of these recordings are the various cadenzas that Katsaris wrote for this Concerto: some are composed in conventional, classical style ŕ la Mozart, while others, more free-ranging, hold their own against Liszts paraphrasing, with wry allusions to The Queen of the Night (The Magic Flute), and Beethovens Waldstein Sonata and Emperor Concerto, all of them dovetailed into magnificent counterpoint nurtured by the pianists inherent virtuosity. 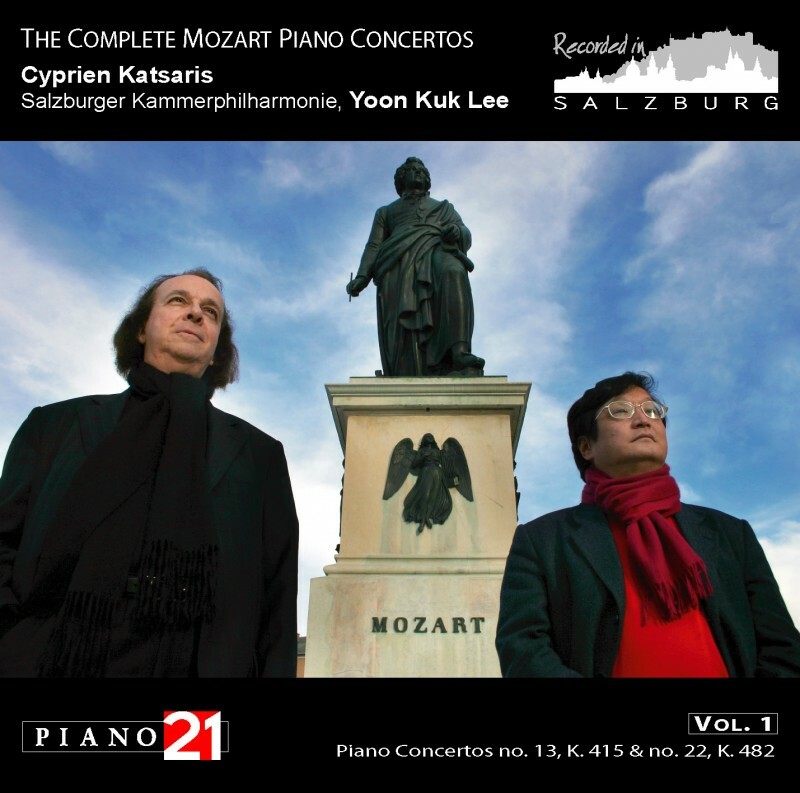 Volume 2 recorded live in the Grosser Saal of the Mozarteum in Salzburg by Cyprien Katsaris with the Salzburger Kammerphilharmonie conducted by Yoon K. Lee is part of the complete Mozart piano concertos performed in Salzburg and Vienna. It features the celebrated Concerto no. 23, K. 488 and no. 17, K. 453, dedicated to his pupil Babette von Ployer. This recording also offers us two alternative cadenzas, both ascribed to Mozart himself: K. 624 (626a), no. 23 (K6: no. 49) for the first movement (track 7) and K. 624 (626a), no. 25 (K6: no. 51) for the second movement (track 8). A bonus feature on the disc is the Lacrimosa from Mozarts Requiem as transcribed by Sigismund Thalberg; this is a masterly interpretation of the wrenching fervour expressed by Mozart in this renowned piece. 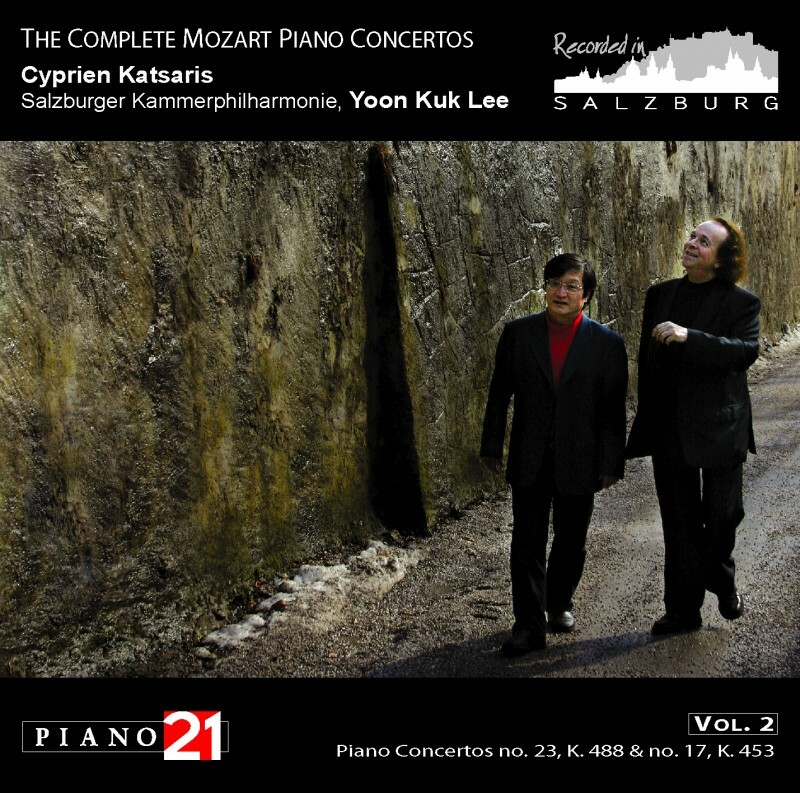 This private recording comes from a concert given by Cyprien Katsaris in Stuttgart on 7 September 1991. 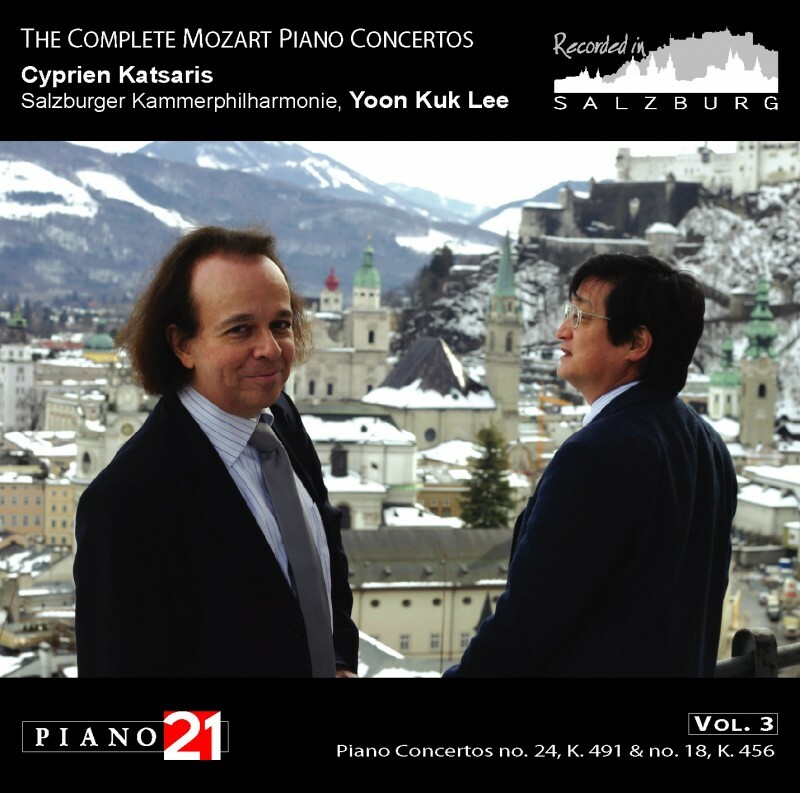 Volume 3 recorded live in the Grosser Saal of the Mozarteum in Salzburg by Cyprien Katsaris with the Salzburger Kammerphilharmonie conducted by Yoon K. Lee is part of the complete Mozart piano concertos performed in Salzburg and Vienna. It features Concerto no. 24 in C minor, K. 491 and no. 18 in B flat major, K. 456. The decision to put these concertos on one CD was based on the fact that both contain variations, which are very rare in Mozarts concertos. Another unique feature of this recording is the two cadenzas, compositions in themselves, which Katsaris has created for the first movement of no. 24: whereas the first endeavours to approximate to Mozartian style, the other, freer cadenza, affects an affinity with Beethoven, who indeed was known to have Mozarts 24th in mind when he was composing his own 3rd Piano Concerto, also in C minor. Katsaris renders this idea musically by summoning up Beethoven through highly refined musical devices, such as his allusions to the finale of the Sonata Appassionata. 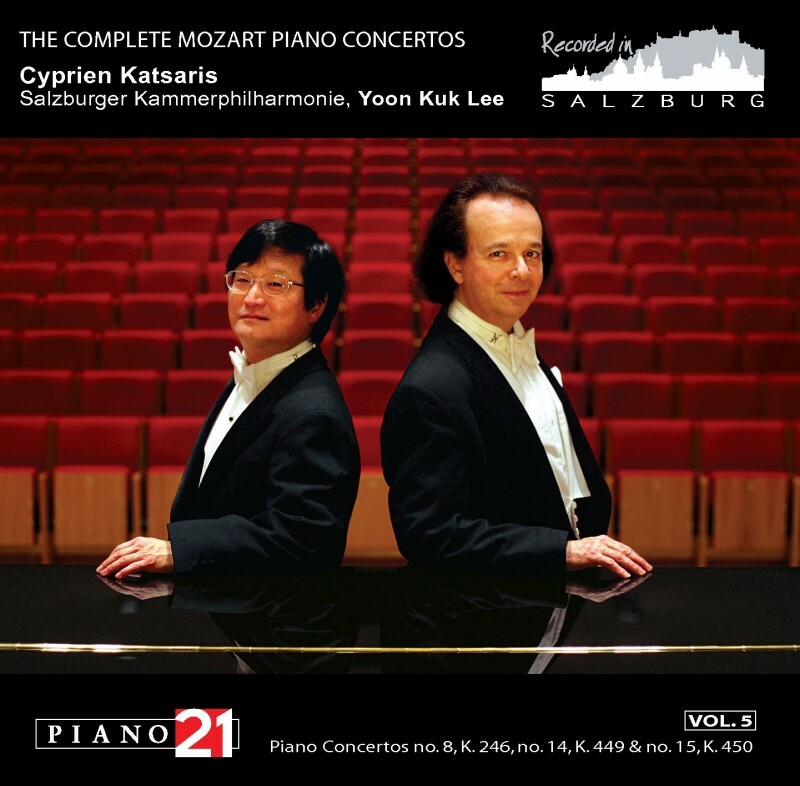 Volume 4 recorded live in the Grosser Saal of the Mozarteum in Salzburg by Cyprien Katsaris with the Salzburger Kammerphilharmonie conducted by Yoon K. Lee is part of the complete Mozart piano concertos performed in Salzburg and Vienna. It features the celebrated Concerto no. 21, K. 467 and the flamboyant no. 16, K. 451. In this recording, Katsaris has included his own cadenzas, compositions in themselves, for the first and third movements of Concerto no. 21: Cadenzas A affecting something close to Mozartian style and Cadenzas B following a freer pattern. 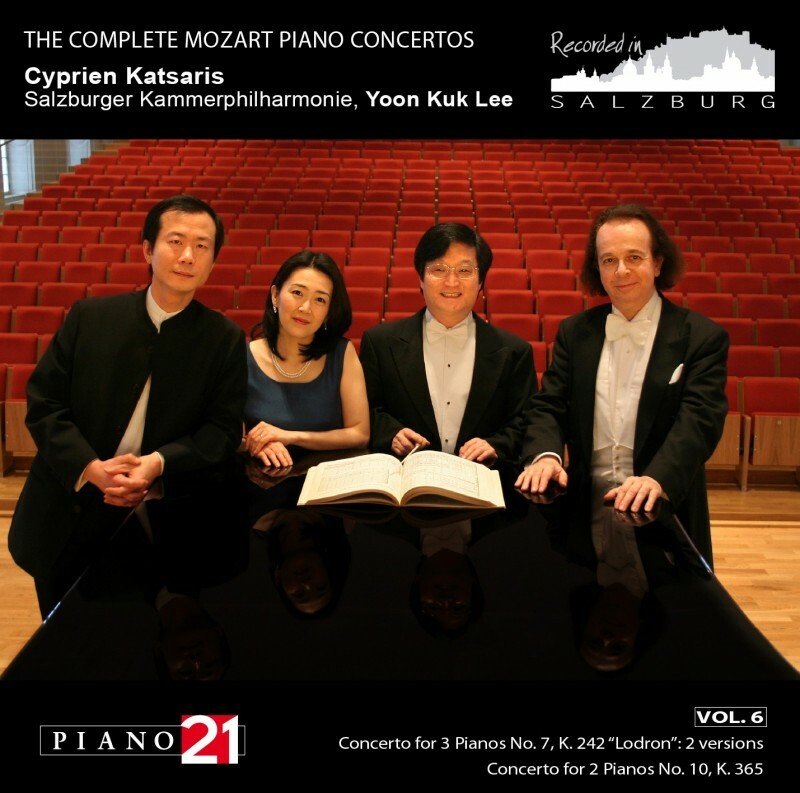 Volume 5 recorded live in the Grosser Saal of the Mozarteum in Salzburg by Cyprien Katsaris with the Salzburger Kammerphilharmonie conducted by Yoon K. Lee is part of the complete Mozart piano concertos performed in Salzburg and Vienna. No works could be more contrasting than the three offered here. The consummately aristocratic elegance of Concerto K. 246, composed for Countess Antonia von Lützow is followed by Concerto K. 449, dedicated to Mozarts pupil Barbara Ployer, into which Mozart instills a very personal, intimate language, giving free rein to many changes of mood. The brilliant Concerto K. 450 is one of his most virtuosic; Mozart reserved it for his own private use. It is of no little interest to hear the two-piano version of the same Concerto as revised by the composer to play with his sister Nannerl. 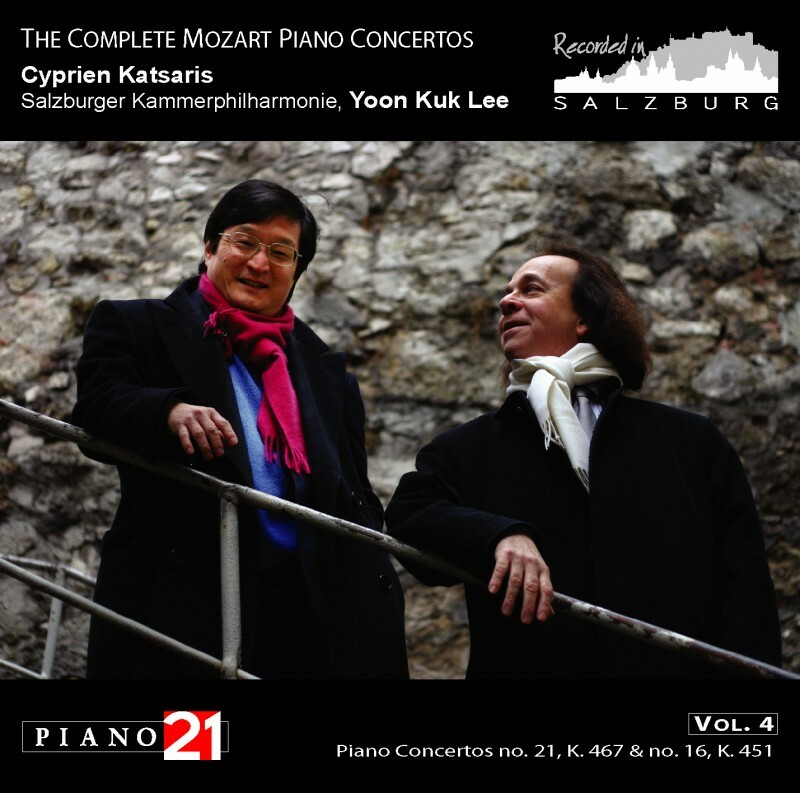 In this seventh volume dedicated to concert recordings of the complete concertos of Mozart by Cyprien Katsaris and the Salzburger Kammerphilharmonie under the baton of the Korean conductor Yoon K. Lee features two special works. The first is the Concerto for piano and orchestra no. 27 in B flat major, K. 595, a particular treat for music lovers, on two counts: not only is it Mozarts last Concerto, completed on 5 January 1791, but also it was to prove to be the last he ever played in public as a soloist, in the prestigious Ignaz Jahn Hall in Vienna on the following 4th of March. The Concerto in D major, K. 175, considered to be his fifth, was actually the first original piece for harpsichord and orchestra of a young composer of seventeen. Concertos previously had been arrangements of harpsichord sonatas by various composers including Carl Philipp Emmanuel and Johann Christian Bach. Offered alongside one another in this album, these two works trace a unique trajectory in the history of Mozart concertos. The Rondo for piano and orchestra in D major, K. 382 is actually an alternative version of the finale of Concerto K. 175, which Mozart often played. Settled in Vienna for good in 1781, the young composer wanted to woo his public with a light, playful piece very much attuned to the taste of the times.